Poly-Tech sleep and W8MD medical weight Loss center is a physician supervised, non surgical, insurance medical weight loss program in greater Philadelphia. Also designed as a sleep disorder management clinic in addition to being one of the best insurance physician weight loss programs, our W8MD’s weight loss program is for those that have tried all fad diets in the past and need a weight loss program that is based on science and medically supervised. As one of the very few medical weight loss programs in greater Philadelphia area to work with most of the insurances for physician weight loss visits, our weight loss program attracts patients from both nearby counties of Chester County, PA, Bucks County PA, Delaware, Philadelphia counties but also near by states such as New Jersey and Delaware. Our weight loss program in the King Of Prussia are is unique in many ways! We use delicious and affordable specially made W8MD low calorie protein weight loss supplements including protein shakes, protein bars, and other meal replacements to keep the caloric intake to 800 calories to about 1200 calories. Since the protein requirements are met, and appetite is suppressed, most of our patients are able to lose weight fast without being hungry all the time. What makes W8MD’s insurance weight loss program one of the cheapest weight loss program in greater Philadelphia? Our biweekly weight loss program cost of $50.00 includes up to two appetite suppressant medications / diet pills when dispensed in office or 3 boxes of low calorie protein shakes and other weight loss supplements with 7 low calorie meals in each box. Our weight loss results and testimonials speak for themselves! FDA approved appetite suppressant diet pills including, but not limited to, Combination of Phentermine and Topiramate for fast weight loss (Qsymia) most popular and most effective weight loss pill, new diet pills including Belviq, Contrave, Saxenda along with traditional diet pills Phentermine(Adipex), Topiramate, Phendimetrazine(Bontril), Diethylpropion(Tenuate), Xenical to name a few for hunger control and fat burning. Sleep disorder management including sleep apnea, home sleep studies, CPAP and BiPAP, insomnia care, restless leg syndrome, narcolepsy etc. 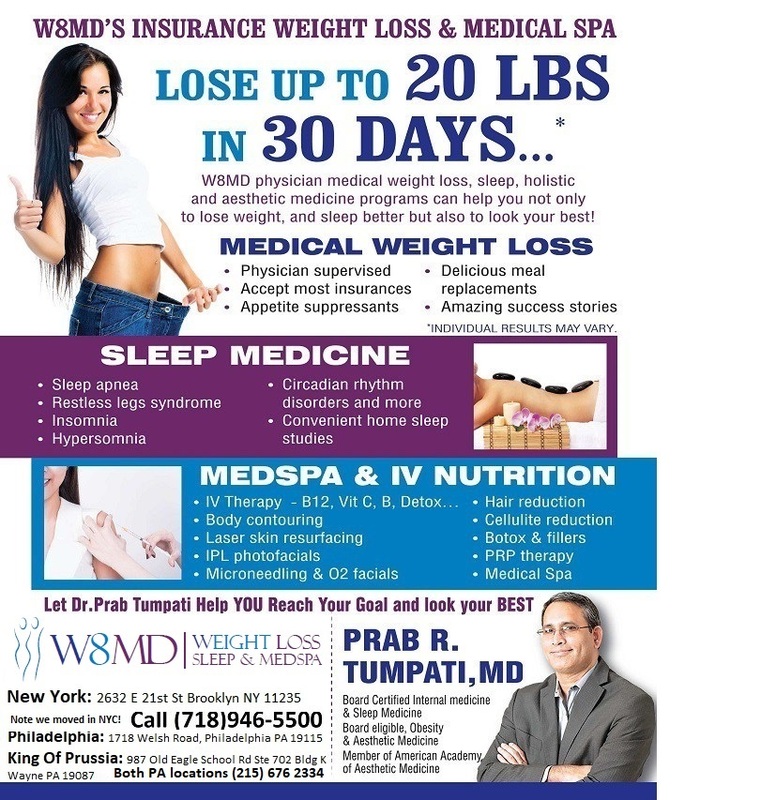 Our Medical Director, Dr. Prab R. Tumpati is one of the few medical weight loss physicians with special education and training in the new field of obesity medicine, passed a written board examination in the field of bariatric / obesity medicine, and is the founder of W8MD Medical Weight Loss Centers of America. Dr. Tumpati is also board certified in internal medicine and sleep medicine and can address any sleep disorders or primary care or preventive care issues. In fact, our weight loss service is designed to help prevent over 50 obesity related conditions including diabetes, heart disease, cholesterol abnormalities and even cancers as obesity is a risk factor for many chronic medical problems. With no setup fees, and most insurances being accepted for the weight loss physician visits, losing weight in greater Philadelphia area has never been easier. Think W8MD for weight loss! Call 1-800-986-3007 (W8MD-007) to learn more. Cities Served: Exton, Radnor, Paoli, Collegeville, Plymouth Meeting, Wayne, King Of Prussia, Philadelphia, Norristown, Plymouth Meeting, Lansdale, Horsham, Pottstown, West Chester, Paoli, etc. Payments: Accept Most Health Insurance for the physician weight loss visits including Blue Cross Blue Shield, Aetna, Medicare, United Health Care, Cigna, Tricare, Key Stone Health Plan East, Keystone first (PA Medicaid) etc.. Accept American Express, Mastercard, Visa, Discover, Check, Cash for weight loss supplements. What our patients losing weight say about our weight loss program? I have tried every diet available. Some were successful at first, but then they all failed. I was severely over weight, which was dangerous to my health. I met doctor Tumpati by chance. When he told me he was a diet doctor I told him I would be visiting him soon. The doctor is very kind, and patient. He takes blood pressure and body measurements every visit besides your weight. There are some medications involved but the doctor is flexible and helpful if changes are needed or a medication needs to be discontinued or changed. Dr. Tumpati and staff were very courteous. The doctor took time to explain my condition, the methods to treat it, and his recommendation for treatment in my particular case. I was not rushed in and out in 5 minutes as with many other doctors. I would recommend Dr. Tumpati to others – Verified patient. Lose weight, sleep better and live longer with W8MD!